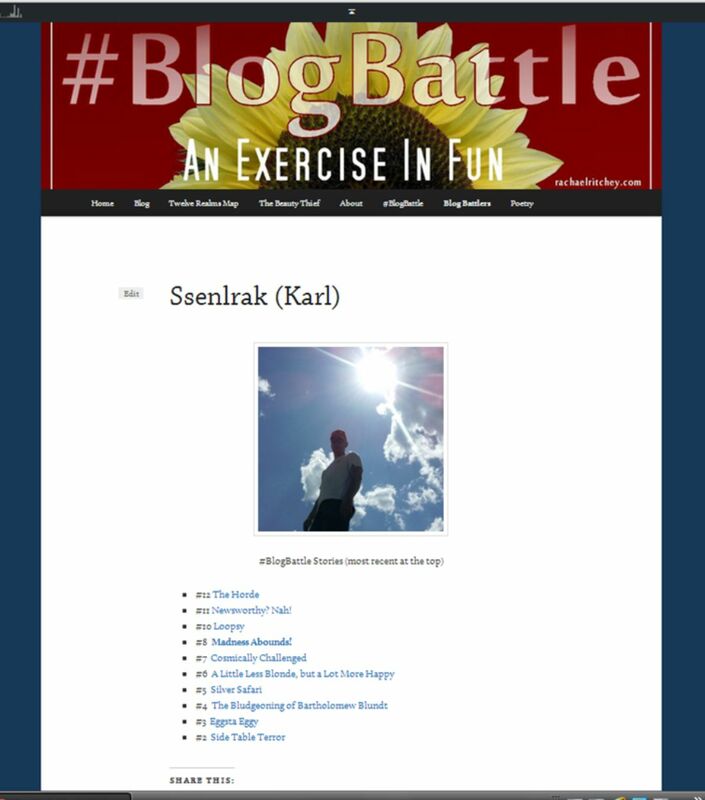 As you all know, we’ve been running this fun weekly activity called Blog Battle. We’re heading into the eighteenth week, and I gotta tell you all how much I appreciate your participation and support! 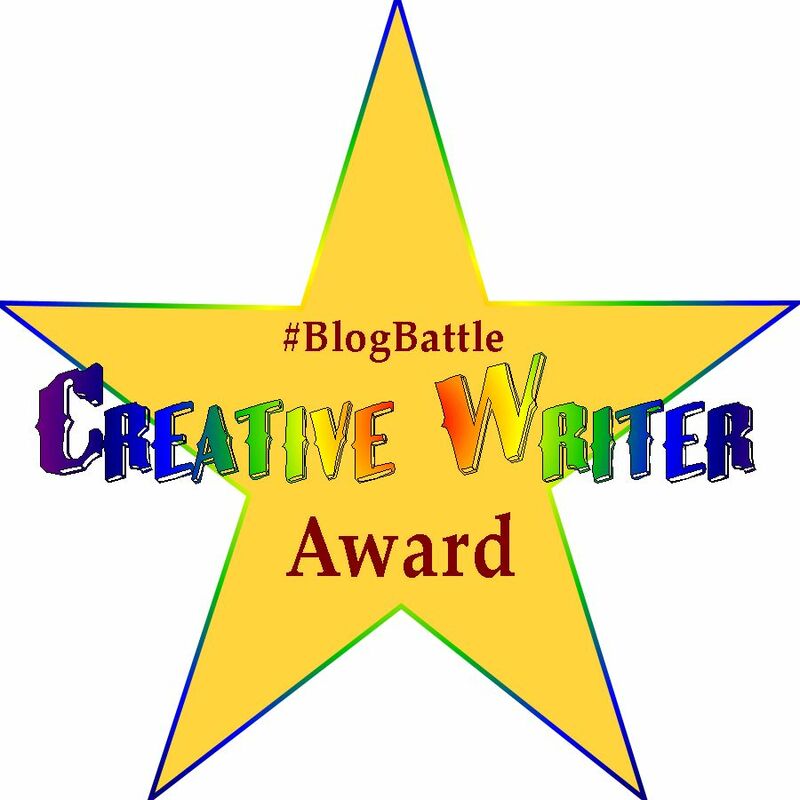 The battle just started out as a fun little competition between blogging friends. Now, because of the battle, we’ve added more friends to our ranks, and the battle continues to rage week after week. Today, my goal is at least twofold: I’d like to offer some basic info about the battles and make sure you are all aware of the special individual Battler pages I’ve created for each of you. What I see as an asset to the Battles, because they are ‘short stories’ of 1000 words or less, is that the stories which do not require an explanation or have any continuation do the best as far as reader participation. It’s not that people don’t like the longer, serial stories, because they do! But I think the overall readership of our battle stories would improve if they were not serial because it would be easier for newcomers to read all our stories without feeling like they need to go back and read a lot of other stuff to catch up. Sometimes people will do this, but if they’ve just heard of the battle, it might be overwhelming to think about going back to reread previous short stories to catch up. We tend to read blogs because they are snippets of information, and we are all short on time in this crazy place we call the world. I think most people don’t like to jump into the middle of stories either. It’s too confusing. NOW, this is just an observation, so if you want to continue your serial story, please feel free to do so! 🙂 I know I’m enjoying them! Battles are meant to be fun. Write the stories you want, and please keep that PG (PG-13 at most) content in mind. I know it can be a fine line since it’s kind of subjective in writing. HAVE FUN. Contact me if you have questions or concerns. I will do my very best to address any need you have. Every one of us is busy with our lives outside the information highway, so it’s okay if you can’t participate every week! Jump back in as soon as you can! Even if you don’t have time to write one, please keep on reading & voting each week. The participation of commenting and voting is still essential to the battle. It’s a two-way form of communication and support. You are valuable! Invite all your friends and followers on social media to read our free stories every week and vote. Create excitement around the battles so we can share the experience with people who just enjoy reading a good story and like to have a say in the winner of a little friendly competition. The more people reading and voting, the better! If I think of anything else about info, I’ll add it here. For now, I’ll move on to the Battler pages. My menu bar has a link called Blog Battlers. If you click on it, there is a list of links to your individual pages with thumbnail photos of each battler plus a link to your own blog. If any info is incorrect, misspelled, or missing, let me know. Each Battler currently has one of these pages on my blog. The page includes (if I have one) a photo of the battler linked to their own blog (if they have one). It has a list with links to all the stories you have written for the battles. If I have missed any of your stories, please let me know! If you want a different picture, please send it to me. If you are an author and would like a link to a page displaying your works, please send me the info. This is my way of honoring each and every one of you for your contribution and support each week. I’m hoping I’ll be able to keep up with all this because the idea is with each Battler page it will be easy access for anyone who searches out your stories or your profile. Okay, all you battlers and potential battlers! I hope this information was helpful and THANK YOU for being a part of the #BlogBattle. It means a lot to me to have you here and I hope you can see you matter! Awfully kind of you to say. I agree with you. Once I thought about it, I realized it can't be easy for new people to jump into a story series in the Blog Battle. Right now I just don't have the time or energy to think up something new each week. And the Battle forces me to keep writing a series that I probably would put aside and not write for years otherwise. I'd like to make Madnes Solver into a published work some day, too, so because of all these things I think I'll stick with doing a series. Though I might change it up and throw in a poem or something else short one week or so a month. 😀 I know I really enjoy your Grecca series! Thank you for the sweet compliments, E.! I fully understand the dilemma. 🙂 We want Madnes Solver to become a novel as well. The info was more about an observation than a requirement. I love the continued stories, but I’ve also been there from the start. 🙂 we are really so glad you are a part I’d the battles and works be terribly horribly awfully disappointed if you ever chose to stop participating! You are not allowed. 😉 just being a party of it and all the encouraging words us award with for me. ♡ Just thanks so much! That’s a great word I’ve had to use repeatedly with this lovely, supportive group of people, too, John. 🙂 Thanks. This is a outstanding undertaking, Rachael. I’m so pleased to be part of this fantastic community. ❤ ❤ You're a busy, busy lady. Two thumbs up for YOU and thank you! Th Dream is in! I’ve got some reading and voting to do. Where are the current ‘dream’ entries, Rachael, or am I being dumb. I can’t find them on your blog? Thank you Rachael. I’m planning to join in again this week with the theme dream…. Good. 😀 I am looking forward to reading it! Wow this is a lot of work! I am still wondering if I’ll join this week, not much time left… For now no story has turned up. No you are not rambling at all! I appreciate the scripture! AND you were creating a fantastic quote and didn’t even know it. When the river of the Word gets to bubbling inside of you, one can hardly keep it from rushing forward. Some will think it is rambling. Those who understand its power recognize it for what it is. JOY! this is great rachael! the effort you put into this week after week is somewhat stupefying. all the best – i.m. but let’s face it the real prize of your BlogBattles is the community your building – and that’s something real on or off line.